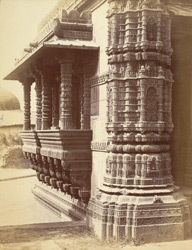 Photograph taken in the 1880s by Henry Cousens of Rani Sipri's Mosque in the city of Ahmadabad in Gujarat, from the Archaeological Survey of India Collections. This small mosque, built in 1514, is also known as Masjid-i-Nagira or Jewel of a Mosque due to its elegant design. It has two aisles and three bays, an open facade and a crenellated balustrade over the cornice. This is a view of the south facade taken from the south-east corner showing the base of a minaret and the end window, both covered in stone tracery with intricate designs.